You'll find a football field at La Palombiere. The waterslides at La Palombiere will keep the children happy all holiday. The whole family can discover the park and surrounding area on a cycle during your stay at La Palombiere. La Palombiere has plenty of areas for you to explore. Want to have a closer look at La Palombiere? If you think La Palombiere in Sarlat, Dordogne is the holiday park you, why not have a closer look, and check out prices and availability. La Palombiere family holiday park has 199 pitches. Eurocamp have family holidays parks all around Europe. 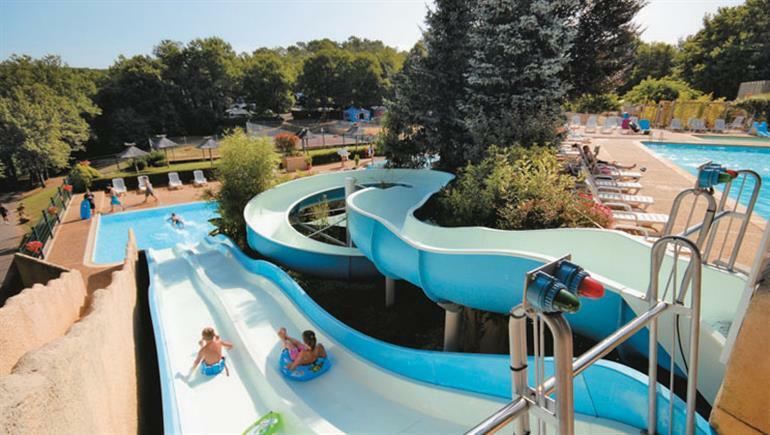 La Palombiere (DR012) is just one of the family holiday parks in Sarlat, Dordogne, France. Have a look for other holiday parks in France. You can also see what other people though with the reviews of La Palombiere. These are the reviews for La Palombiere. There are 150 reviews. The holiday was good but there was a problem we discovered on the first morning trying to cook breakfast. The gas oven would not light. After informing our courier there were a number of courier visits to attempt to light the oven but to no avail. We were offered a move to another mobile or the use of an oven in another mobile but did not want to move again. We were finally told that the repair man could not come until the day we left. We expected some facilities to be unavailable due to our holiday being so close to the end of the season, but all of them. It was so diminished to the point, happy hour in a bar with no draught beers. Sarlat the place beautiful, campsite with no facilities ugly. Might as well been in a field. The young lady couriers were all very hard working but stayed very friendly and cheerful and helpful. esprit chalet had air conditioning which was needed in the heat of the day. this year we did not have a private parking space and were expected to park in the road. Lovely campsite, homes well spaced with personal space around accommodation. Site was very quiet when we were there in september. Couriers very helpful and on hand.we were however very disappointed to find no walking guide on site as we were led to believe that there would be in the weeks we were there. We did buy a walks book off the couriers but that was no substitute for a guide. Booked a last minute holiday in september at palombiere. Staff contacted us before arrival to check our arrival time and general requirements, made us welcome on arrival and periodically checked on us. Found the caravan to be comfortable, properly equipped on a pleasant quite private pitch. Very nicely laid out site with shop, restaurant, bar and swimming pool, all very good standard. We love the dordogne, just everything about it. the rivers, the rolling hills, the castles, the trees, the people, the amazing history.. it is a very compact area, so you do not have to go far to find wonderful places to visit and september is ideal because nowhere is too busy, and the weather can be wonderful. it certainly was for us; the only drawback was that the mornings were just a little too chilly for breakfast on the deck, but we were rewarded by mid to late morning with lovely blue skies and temperatures conducive to exploring or canoeing! We've been to this site on numerous occassions over the last 20 years or so initially with our young family and now as a couple. The facilities are excellent and the staff very friendly. Excellent site for exploring the dordogne. Wonderfully relaxing place with enough to do on and off parc if wanted to. A beautiful area, pretty villages and some where I will go back to. The park has a great pool area but the pitches are awful, built on a steep gradient with masses of acorn trees that block out all daylight from the majority of the pitches. Hardly any space to park your car's. Caravan was dirty on arrival and had electrical fault every time you walked over the kitchen floor. Some caravans had a flight of crumbling steps down to them and steep drops infant of them with a failing mesh fence in front.. .wouldn't want to be in one with a small child! acorns constantly dropping on caravan roof irritating and woke us up several times through the night. .
We love this site and have visited it three times now and hope to visit again next year. Really lovely site. Excellent facilities. Euro camp team were great, very friendly and helpful. Only negative was that the bunk beds were small. My son is 13 and the bed was too short. Ok for young children. One of the best family holidays we have had! We loved our holiday at palombiere! location great, facilities great, couldn't ask for more. We had a great holiday at this lovely campsite. it's in a great location for exploring the delights of the dordogne (in particular sarlat is stunning and a kayak ride along the dordogne is a must). the campsite and our mobile home were spotlessly clean. . . be warned that the entertainment goes on until midnight and is so loud that there was no way we could get to sleep before this time (i'm six months' pregnant so would have appreciated a few early nights!). maybe we were unlucky with where our mobile home was pitched but we also felt that the homes are crammed in as we could touch two other mobile homes from ours!. . also the holiday club is not available to eurocamp which was disappointing for our children and many other familiies staying in eurocamp accommodation. . . having said all that we had a great holiday but would try another campsite in the dordogne next time. A lovely campsite offering good facilities. Great time in a lovely friendly park with superb facilities. Lots of great places to visit on your doorstep. Really enjoyed the family canoe trip down the dordogne river. We were deeply disappointed with the quality of accommodation. It was run down, smelled of damp and was freezing overnight. It was wholly unsuitable for a baby. The camp facilities were fine but we could not stay in the chalet. We therefore only stayed two nights then moved to an apartment in sarlat whilst keeping the keys so we could at least allow our toddler access to the pool. Fantastic parc, very contained so extremely safe for our 11 year old. Beautiful location and scenery. Would have liked better coffee, hot chocolates etc in the bar as I don't drink so was limited to tea with not very nice milk! staff were a bit luke warm if I am honest at the bar and downright stressed at happy hour, waitresses very efficient as girls in shop. Would definitely return to this site and area. We had a wonderful first family holiday out of the uk. A great base to see a beautiful region. The kids loved the pool and play areas. The staff were all very friendly and spoke english. We had lovely holiday at la palombiere. the cabin was well kept and beds comfortable. I really liked the small size of this campsite, which was well maintained, as large sites can just be overcrowded and noisy. lovely pool complex which my boys couldn't wait to get to each day! eurocamp staff were friendly and popped in to see if we were ok. would recommend and go again if down that area of france. We really enjoy this parc and holiday, very safe for kids not too big. friendly and helpful staff. no too busy and caravans/tents not on top of each other. only really fault was the entertainment sometimes took over the whole bar area so if you just want a quiet drink and chat it was difficult. Fantastic holiday, great site in a beautiful area!! will be returning. Great holiday for all ages. Look forward to going next year and having a more modern mobile home. This is our second visit to this area and it did not disappoint. Loads to see and do for all ages. We will be back again. A very nice family park. Great family holiday. We were able to relax and have fun in the pool, play lots of sport, conoe down the river and enjoy the beauty of the region. Our only issue was with the weather!! Great holiday and park, kids loved the pools, climbing area and football. The caravan was generally dirty, with extensive dust and fluff under the beds. The seating area had stick seats and also a rip in the seat material. . we reported this to the couriers, who offered to was the seats and stitch the rip. . the accommodation should be clean and ready for the paying guests. Lovely location,especially being close to sarlat and the dordoigne region which we spent a lot of time viewing. Only negative was the long drive from calais, would have been better if we had stayed somewhere for the the night on the way down. Jennie was superb! accommodation was too small will pick larger unit next time. Not happy to learn that we pay a lot more than the french and germans!! for the same holiday!!. This is a really nice mid-sized parc with a decent range of facilities, activities and entertainments. The plots are a good size and you don't feel like you are all lined up in a "streets of houses" as in some parcs. Plenty to do in the area if the weather doesn't justify a day by the pool. The restaurant in the bar and the nearby restaurant in ste-nat can be a bit slow, but decent range of food. A good site, with lovely pools and good facilities. However, it took us an age to get served in the restaurant, and waited an hour and half for food to arrive – hence, we only ate there once! We had a fab few days here with the children. The weather was glorious mostly, but when it rained we had a few small leaks in the caravan. Loved the blackout blinds in the caravan. Could be more choice of cafe/restaurant. The wasps were annoying at the restaurant so some beer pots would have been useful. On arrival the reception staff were very helpful and friendly. We stayed in a mobile home and as the park is situated amongst lots of trees it offers plenty of shade. Swimming pools are ok (i've been to better) but served their purpose. The bar area is clean and tidy and offers nightly entertainment and quizzes, food is also available, we ate there twice and were very happy with the quality of food. A great site especially for children. Our 4 year old loved the swimming pool area and the trampolines. Our accommodation (a new avant mobile home) was lovely and clean and the plot was spacious. . the only drawback of this site is that the on site restaurant we felt was unable to cope with the number of customers and the menu was far too big for them too. On our last night we waited almost 2 hours for three meals and when they eventually came it was all cold. We asked for fresh ones but by this time my child had had enough! there was no real apology or offer of compensation so we left and told them we would only pay for drinks. So if you are going in august I suggest you bbq! apart from that small glitch the rest of our stay there was fantastic! Great holiday great weather,accomadation bit disappointed. Enjoyable break, good parc, good restaurant and fine facilities. Great region to tour. Plenty to do and see. Almost guaranteed weather. Cost of living in area is high. We loved it all. The best feature was the dance teacher who provided exercise classes and aqua aerobics very day. Fantastic. This is a really nice and well-kept campsite. Staff at reception are friendly and helpful in suggesting local attractions. The shop is basic but has the necessities and with sarlat just under 15min drive away, this isn't really a problem. The bar area is nice and overlooks the pool. It's also close to the younger children's play park which is useful. Evening entertainment can be late for younger children but the 'jeu d'apero' is a nice bit of pre-dinner fun. Increased staffing at busier times might be an idea at the bar but we didn't really find it too much of an issue. Pool area and grassed sunbathing area were good and the addition of the indoor pool next year looks like a good plan. The site isn't level and nor is the surrounding area, so a bike to get around the site is only good for those who can cycle the hills and other cycling with families is probably restricted to the banks of the dordogne. Mobile homes and tents are packed into a relatively small site but it didn't feel crowded and pitches were well demarcated including parking. All in all our children (12 and 4) had a nice time on this site and it felt safe and friendly. Great site but .poor quality caravan, very dated and cramped inside. Very disappointed. Gorgeous site, nice area, felt very welcome and wished i'd stayed longer. Pleasant parc, fabulous area, mixed weather. Great park apart from very loud music almost every night - not great with young children. It would have been nice to sit on the deck in peace and quiet in the evenings. Everything very clean around the camp. Mobile home not very comfortable - beds, outdoor furniture etc. The couriers were very good, always happy to help. lack of life guard at the pool was a bit of a worry sometimes, he appeared to be part time. We monitored our children closely, some people did not. We were surprised that there was not a constant life guard presence. The camp was nice very quiet, the facilities were good ie swimming pool and playgrounds. A couple of things though; there was only one lifeguard and as there are two pools on separate levels and water slides I didn't think this was enough, also the steps in between the two pools were not wide enough and a little dangerous I felt and also there is no shade by the pools. Don't use the restaurant unless you want to wait 2 hours with children to eat!! but on the whole a nice little campsite. The campsite was lovely and well maintained. A great region and a lovely parc. great for families looking to explore the region. Very goodsite. Excellent facilities. Plenty to see and do in the area. First time we have taken two grandchildren abroad on holiday. They had a super time on the parc and around the area. Park was great, very clean and quiet. Good location, very friendly staff.plenty of activities, beautiful scenery. Only gripe would be the restaurant/bar, it is very understaffed and as a result dinner took >90 on 3 occasions, there where a lot of upset customers! also the food was very basic, e.g. Stake'n'chips was exactly that with no side salad/sauce or anything! pizzas where good. The bar has only 1 bar person and so the queues where long, you are really missing out on a lot of money for the sake of 1 more bar person! Excellent location, amazing new accommodation and eurocamp couriers are true stars! children are already asking when will they go back to the next eurocamp holiday. The parc is kept to a very high standard, secluded pitches and excellent clean facilities. The staff and couriers on site were charming and hospitable and always helpful. We will definitely return! Very good holiday - aircon in the mobile home was an essential as temperatures were high. Couriers made us feel welcome and soon dealt with any requests. . however, eurocamp does need to take up with the camp site management the problem of the steps linking the 2 swimming pools. Theses are 'rustic' and are not safe, especially when carrying small children between the two pools. There is a makeshift rope at one side but this is slack and of no use. The angle of the steps, their irregularity and tilt make them a serious accident hazard. As the management are proposing to spend a great deal of money on a new indoor pool, surely they can make the existing steps safe? Holiday was excellent. Park was beautiful. We ate at the restaurant a few times and it was really good. Menu includes snacks as well as full on 3 courses. We had some lovely meals. . Very pleasant site with good facilities, although I suspect it could be very busy in high season, particularly as our pitch was on the main road to many of the site-owned mobiles which were nearly all empty. swimming pool complex was great, and with the addition of a covered pool next year will be even better. Dordogne is fantastic area. So many places to visit and darlat market is a must. Accommodation which we choose was too small, not a eurocamp fault. Eurocamp couriers spent a lot of time in and around the pool. They made some inconsiderate comments about holiday makers around the pool. I didn't think that they were on holiday and therefore didn't expect them to be in the pool so frequently. Brilliant relaxed holiday. . couriers are so pleasant and helpful. I would definitely go back again! Excellent site, would recommend to anyone, beautiful setting, very good facilities & food. The staff we some of the best I have come across. The area is fantastic with many places to visit. Small, quiet - suited us with reservations. Hard to locate, directions given were not good, spent 20 minutes finding 'tobac' shop which was just a dilapidated house, no distances given and not on our satnav. We wanted to cycle - way too hilly and no dedicated cycle routes found and many breaks in any that were occasionally car shared. 3 night mini break on way to our house in south of france - it was superb. Friendly , clean, well kept campsite, quiet at the end of the season. Bar and shop still available. Good site, good base for visiting interesting part of dordogne. Lots of prehistoric sites (lascaux) and many castles and stone age sites. Just one point lets the camp site down - inadequate or poor parking for a car on or adjcent to the pitche. The area is superb and the setting of the campsite was beautiful. our parc was in the perfect place to visit the local places of interest. We have stayed on this parc before and it is in a lovely location . the weather was excellent. Unfortunately the season ended the day we left so some services were being run down, but the camp and accommodation were excellent. Nice well kept site with lovely pool complex. Enjoyed being near to sarlat with its well preserved medieval centre. Very enjoyable, a pleasant parc, and dry sunny weather on the whole. Fabulous holiday again.the third this year with your company. The camp la palombiere is gloomy due to it's forest location and this is not mentioned in the website. Our caravan was particularly close to it's neighbour , so there was little privacy the caravan had not been cleaned very well , the floor was filthy, surfaces not clean, broken toilet seat and door handle. We left after one night and found somewhere else to stay for the remainder of our holiday in the dordogne. A reimbursement of some form would be appreciated. Beautiful area of france. restful, peaceful week with a long tiring journey at either end! We returned to this camp site as we had all enjoyed it five years ago. We have three children and all had a great time again. The camp site facilities are excellent and the reception staff very helpful, campsite is pretty with lots of space and there is plenty to do locally. Parc has nicely 'scattered' pitches but many small/cramped almost. Could touch the mobile home siding on to us. Mobile home ok but many newer - I did not book the cheapest! . couriers seen on arrival and once after. Expensive in peak weeks (school holidays!) this always niggles me. Excellent onsite restaurant with good service and good value for money. La palombiere is a quiet well run site in a beautiful location. We had a 3 bed 2 bath cabin/chalet an it smelled of vomit and urine. We stayed one night of 6 and then left. Children (young) were running around with not an adult in site. Not our cup of tea really and dissappointing. We stayed in comfort plus accommodation. it was old, poorly insulated, creaky. The kitchen bin was hanging off, the gas ignition on the cooker broke and on day 9 it leaked when it began to rain! in contrast we stayed in a fantastic 3bed comfort plus mobile on another site; this was well insulated, spacious, newer with proper handled doors and a sprung mattress; so I would also describe the accommodation as inconsistent. I feel disappointed and will not use euro camp again. La palombiere is a great parc. The pools are fantastic and the overall feel of the parc is one that is well kept and looked after. The dordogne is our favourite place in france. The weather was good though quite cold in the evenings due to the location of the site in fairly dense woodland. We have tried most of the eurocamp sites in the region and this was a good site but not our favourite. We only spent one night here and were disappointed. Eurocamp did not meet the high standards that we have come to expect and appreciate over the last 5 years. Sadly the campsite just didn't compare to others in the region. Lovely park, extremely clean and good facilities. Would have benefitted from a lifeguard at the pool to keep an eye on the water slides as they got a bit crazy at times. Overall lovely park and good location. As we expected although the weather could have been a little better. This is our 3rd holiday at la palombiere, we love it here. it's quiet enough so the kids can wander off to the play area by themselves but still plently going on. we will definitely be back. We all thought that the combination of a quality parc and area of outstanding natural and historical beauty made our holiday so special that we are planning to book next year same place for a longer stay. This is a really peaceful parc yet has lots and lots going on during the day for the children. Lovely setting, good pools and play areas. 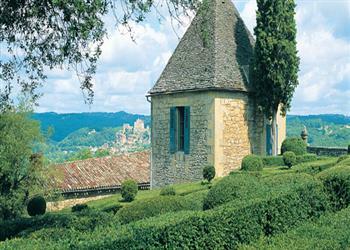 The dordogne is a beautiful area, filled with beautiful villages, breathtaking views and amazing chateaus. The parc is well placed to explore the surrounding area, although is a few miles from other facilities/villages. This is our 3rd visit to la palombiere and yet again we were not disappointed. really pleased with our location on the site. plenty to do. my children desperate to go back again next year! Lovely place, lovely staff on site and couriers. Loved the walking routes, the trip to the market. Booking again. Very disappointed to find that kids activity clubs were not open to eurocamp children. This should be made clear on booking. Contrary to advice, canoeing is only permissable to 5vs and over. This was a well run but relaxed parc in a beautiful location. The couriers gave an excellent service responding immediately to the few requests we made. We had a great holiday despite the weather this year being a bit disappointing. A fantastic site in a beautiful area of france. We enjoyed the relaxing atmosphere on site and being able to explore the surrounding areas. The eurocamps reps were friendly and exceedingly efficient. A wonderful part of france with so much to see and do. Great site with superb facilities and friendly staff. Lovely camp. Nice restaurant, pools great for all family. Kids rated slides best of the 4 parcs we stayed at. Beautiful area. Excellent. It was the quietest site we've ever been on. Incredibly relaxing, scenic and private. This is an ideal campsite to explore the region. The swimming pools are perfect for small children and kept our toddlers entertained. The pitches were spacious but we lacked sun light on our pitch. Two of the couriers on site (ed and jenny) were excellent and really took an interest in ensuring you were having a lovely holiday etc. And kept us updated on a leak being resolved. My only negative has to be the lack of campsite management presence and their interest in safety; no life guards meant the water slides weren't safe with how some of the teenagers were using them plus the trampolines were meant for the younger children and again they were dominated by the teenagers which was a real shame. . .
Lovely site, very clean and tidy in comparison to another site we stopped at on the way. The caravan was a little small I felt for the cost. The pools are brilliant, check the depths before letting children down the flume and slides though as my youngest couldn't touch the bottom. Not really enough sunbeds but I think that is the case at most places during the school holiday. The reception staff were very helpful and polite. Very small pitches and no open space for kids to play other than the over crowded playground. Not a real camping experience. Parc pool v.good. Restaurant v.v.slow service, but food ok. Unable to use on site kids club due to parc owner disagreement with eurocamp over liability insurance. Although nice setting and good pool would not recommend or return. Overall disappointing. Parc was virtually empty, everything was closed down on site. We only stayed here one night en route to the south of france, so it was tolerable. Very disappointed with the location of our chalet. We were right at the top at the back under a forest of dark trees seeing very limited natural light. Very dark and spooky at night, being the only people there. On the second night we returned to the parc in torrential rain, all staff were on their final 'night out' with the camp owners and we were unable to access the site for nearly 45 minutes as our code to enter was not accepted at the barrier. It was approx 9.45pm and not a sole in sight. However, overall because sarlat is a beautiful city, we still enjoyed visiting the area. The parc and chalet location were the awful part. We have been holidaying with keycamp for 9 years now , we now travel as a couple, but still need space so opt for a villanova wich is just right for us . not happy being given a supernova as I remember from our early days with you ,due given it was in very good condition given age ,but very disappointed which I did express to rep on arrival after about 8 hours traveling, she talked over me ,i requested to be moved ,she said they were fully booked ,so we had no choice . the next day people started leaving and they started closeing up mobiles ,the reps did not come near for the rest of our holiday ,felt as if we had done something wrong ,very disappointed .our return to the dordogne was to celebrate our wedding anniversary ,so I would say it took the shine off it. We enjoyed the stays we had at la palombiere and loire, however there is a lot to be said about the stay we had whilst in berny rivière. . we had problems a few years ago whilst away with eurocamp an since them decided to use keycamp but after our last experience in berny I do not think we will be using keycamp again unfortunately. The couriers could not be bothered at all, as soon as we arrived both gas bottles were out, (it does say on the leaflet all these are checked prior to our arrival which quite clearly they weren't) then almost as soon as we arrived we realised the table did not work!! on one side the latch didn't line up properly, the other side had no latch whatsoever, when we mentioned this to the rep she told us we would have to wait until the following day as m & r had finished or the day!. we had 2 small children with us so that was not an acceptable answer, they eventually sorted the gas out and still told us to just manage with regard to the table, it wasn't until we made it clear that this was unacceptable she said she would see wht she could do. We even had to say that we would carry the table from another unit, to which her reply was, we have no spare units!! after a while this was rectified and a table was brought, which was a full table and a bit of a pain due to te size an it having to be up all te time. Also we had paid for decking which we thought would be nice, however the weather was terrible upon our arrival, and there was mould on the decking making it very hazardous, especially seen as though we had a very heavily pregnant lady with us, when we mentioned this, the rep said 'what do you want me to do, clean it?'. to which we replied yes as we were concerned about skeins getting injured, the 2 year old slipped on it the first day, the only person that didn't slip on it during the whole stay was the pregnant lady which wa a good thing, needless to say, the rep never came back to clean it!. the floor in the twin bedroom was absolutely disgusting, it quite clearly had not been cleaned it some time, the curtains in the double bedroom were mouldy, there was some lino missing from the floor i. The living area which was a trip hazard. Quite frankly, the staff tried to fob us off with any excuse to save them doing a job, and every other stay we've had with eurocamp and keycamp, we have received a bottle of wine at te second stay(this being berny) but we never received one. The latter was the least of our problems and we thought we had found a reputable company we could trust with keycamp, but this seems not to be the case. . not one of the reps at any of the sites actually came and asked if everything was ok, te only time we saw someone was when they wanted us to leave or to change the gas bottles. Whilst in berny, one of the bathroom bulbs blew, so I text the reps number to ask them to come and change this, after a few hours we realised this wasn't going to be done, so my husband went to the keycamp cabin and was actually given a bold to change himself!. I also asked the rep for coordinates for disney paris, which I was given, and obviously followed, upon arrival at our destination it was quite clear the rep had given me the wrong coordinates for disney!!. i'm sure where berny is situated most people take a trip to disney yes the rep could not get that right, due to this we lost an hour in disney which we did most upsetting about the whole thing. It was a lazy thing to do and proved that they certainly do not seem to care and wang to help guests. Much enjoyed (except for the weather! - not your fault!). . considering it was the last week of the season, everyone was still keen and helpful. The bar ran out of my preferred beers half way through the holiday and were not intending to replenish before the site closed. this was very disappointing. otherwise we were very pleased with the site. we like the villa grand de luxe but from the brochure for next year this seems to be disappearing. it gave no help in finding the new name for it. A great holiday had by one and all. Have stayed at the park before and would stay again. Ideal location for visiting the local area. Sarlat is a must to visit. When we booked this holiday it was only 2 weeks before the departure date, we did not receive the detailed map of the area,and instructions to find the site from the keycamp reps where very limited. The park itself was lovely, however there were 2 major issues. . the mobile homes where very close together and you could hear people talking and snoring in the neighbouring pitches. But the worst issue was the volume of noise from the entertainment in the evenings. The noise was so great we could not talk to each other in our mobile home. Also it went against the camp rules which stated that there was to be absolutely no noise between 11pm and 8am which included driving of cars as this might reduce the tranquility of the site. When I discussed this with the lady at reception, she whole heartedly agreed, then said we should have booked the week later as the entertainment finished on friday 30th august. We would have booked later had known this was going to be a problem, however there was no mention of this on the keycamp website or in the brochure! the noise was so intrusive that had it not ended 2 nights before the end of our holiday we would have been forced to leave early. . Campsite was ok but a little limited. Nothing wrong with anything but i've stayed at plenty better. A lovely holiday at a great park. The pools and slides were a great hit with us all. Our youngest child lived the trampolines and play park. A really great holiday with a very friendly courier (gina) who was extremely helpful. the pool was great fun and we enjoyed a couple of meals at the welcoming restaurant. my only negative was that, having a caravan close to the bar area, the evening entertainment was very loud. however, it never extended past midnight from which point the site was extremely quiet. we didn't mind too much but know it really bothered some of our neighbours, particularly as the site was supposed to be one of the quieter key camps. overall though, a great holiday. The camp facilities were good though the pool was cold. It was supposed to be heated. Not enough. The evening entertainment started too late, sometimes 10pm. In the parc details it told everyone to be quite after 11pm yet the noise from the entertainment went on later than this most nights. Even the clown didn't start until 9pm which was ridiculous. Children the road down from the barrier as a skateboard park/bike run was extremely dangerous and noisy. The reps accommodation was near and they should have stopped it. Someone will get injured. Great holiday. Love france and love style of outdoor holiday without camping and not a hotel. Being with my children enjoying the river, picnics, markets, villages, food, caves, castles and of course the weather helps! .... a beautiful area that I keep coming back to..roll on my next visit. Lovely parc set in beautiful surroundings. Pool and parc was kept extremely clean, owners appeared quite grumpy but we had no need to deal with them. Restaurant very nice, although lacking enough members of staff. Key camp staff were very helpful and will definitely be using key camp again, shame there were no organised kids activities etc available unlike canvas who had a lot for their guests. Beautiful area. Family friendly campsite with good enclosed pool complex & play areas for the kids. The site needs more sun beds at the pool to prevent the 10am queue before the gate is unlocked! lots to see in local area; loved the street performances & atmosphere in sarlat. Had a lovely holiday & are returning to the dordogne next year. It was a nice parc. But my son and daughter went to play a game of water polo and the lady who was in charged arranged it to be english v french. Whilst playing a french girl got hit in the face by the ball and turned attacked my son who is 11, she grab him round the neck scarted him under the arm and pushed him under the water. The lady in charge and the lifeguard did not speak to the girl or offer any help to my my son I had to deal with after his sister pulled him out of the swimming pool. We had a fantastic holiday, great weather and great location! A lovely parc set in leafy woodland. Big enough to have good facilities but not so big as to be overwhelming. A great holiday in the sun on a well maintained good size parc. Just what we came for. Really enjoyed staying here with the children. Park facilities were really good & all of the staff very helpful and friendly. We didn't use the children's clubs. We were the furthest from the bar which was very noisy until late so I definitely would not have wanted accommodation any closer to the main area. Nice mature campsite, with facilities appropriate for number of campers. very friendly, kids loved it and of course the area is perfect for a young family holiday. Overall we enjoyed the holiday. there were many places to see. the town of sarlat was busy and had lovely restaurants. The couriers were great. Overall a great holiday thanks! Gorgeous and well maintained park with excellent facilities. Lovely setting with holiday homes nestled between trees. We would not stay at this parc again - it is too far off the beaten track for an overnight stop. I would not want a holiday there because of the quality of the road (about 20km) to the camp. Great site and couldn't ask for more. Only problem was no linen left at our 2nd site and couriers not bothered - at alicourts.